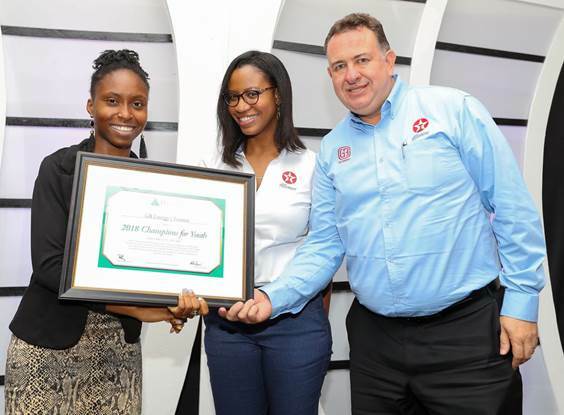 GB Energy – Texaco awarded President’s Award! GB Energy – Texaco, eager to be part of such a historic and noble cause, jumped on board with Junior Achievement since it’s inception back in 2015 by continuously sponsoring a BizTown booth. Junior Achievement (JA) is the world’s largest organization dedicated to educating students about workforce readiness, entrepreneurship and financial literacy through experiential, hands-on programs. JA Jamaica programs help prepare young ones for the real world in a four-week learning experience by showing them how to generate and effectively manage wealth, create jobs which make their society more robust and apply entrepreneurial thinking to the workplace. Students put these lessons into action and learn the value of contributing to their communities by harnessing daily life skills, good values, and positive attitudes. Most notably, the program focused on developing a healthy work ethic. The Junior Achievement BizTown’s curriculum can be paired with that of grade five classes with a one-day visit to BizTown, where students fill posts for which they applied. Students arrive for work at 8:00 am and head to their respective places of work to obtain their duties for the day as well as a scenario card that outlines a task. Before the daily duties begin, all gather at a Town Hall meeting convened by the BizTown Mayor, who allows representatives from each job post to speak about the products and services they offer. When young “employees” go on break, they then become consumers at BizTown and get the opportunity to go to the various booths to conduct their businesses. They can either go to the bank to deposit the money they have earned, pay their bills, go to the tuck shop to purchase their meals or fill up their tanks with Texaco fuel for the journey back home. The JA BizTown program endorsed by the Ministry of Education, is the first of its kind outside of the United States. We cannot stress how important this program is and how absolutely proud we are to be part of this grand effort.